Button overload with the christmas presents makes this year! Just a few button cushions…. This year after realising I could no longer ignore the bursting state of my button box I decided to tackle the issue by making some button themed cushion covers for christmas gifts. the only downside to this brilliant idea I had was this I slightly underestimated how many buttons I would need and despite having enough buttons to fill a small room I ran out of the colours I was needing so had to go and buy more to finish them all off…..typical! So now despite making a slight dent in the button mountain I have added some more back in from the leftovers I had after finishing the cushions! The 3 pictured here were just the beginning…..
To make these cushions I used fabric quarter sets by The Craft Cotton Company in Ombre Trends (green, pink, and blue) and Gold Metallic. I used one fat quarter piece to make the front cushion piece and two more of the fat quarters folded in half to make the two back pieces of the envelope cushion. Then I sewed my button detail onto the front by drawing the star or heart outline onto a piece of paper and pinning this to the middle of the fabric. I then sewed on the buttons within the outline. Once I had filled in the outlined area I tore off the paper, which left the buttons behind. I then placed the button front right side up and placed the two folded fat quarters slightly overlapped on top of this, trimmed any excess then sewed around the edges. Next I turned the pillow the right way around and sewed a binding around the edge of the pillow which I made from strips of the ombre trends fabric, first sewing the binding around the front placing the raw edge of the binding against the edge of the pillow, the binding was then folded around to the back and sewed to secure. I thought I was pretty much on top of all the Christmas makes I have left this year, that is until I saw a unicorn uploaded by Toft on Instagram and I suddenly realised I had overlooked a make on my list – a unicorn for a friends little girl. Sheer panic started to develop as I didn’t know if I had enough time to make it for passing presents over his weekend. Luckily I had already bought the wool and put it to one side so I could get started straight away and the pattern was from one of my favourite crochet books – Edwards’s menagerie by Kerry Lord. The unicorn is put together using the pattern for the horse with a horn from the highland cow for the unicorn horn – I saw this modification online a while back on their website (http://edwardsmenagerie.blogspot.co.uk/2015/07/chardonnay-mythical-cousin-chablis.html?m=1) and knew it would be perfect for what I was wanting to make. After some frantic hours of crocheting I finished this little cutie late on Friday – just in time to get pictures and wrap early on Saturday before it went off to go under my friends tree….phew! Hopefully I have no more makes that have been forgotten about……. 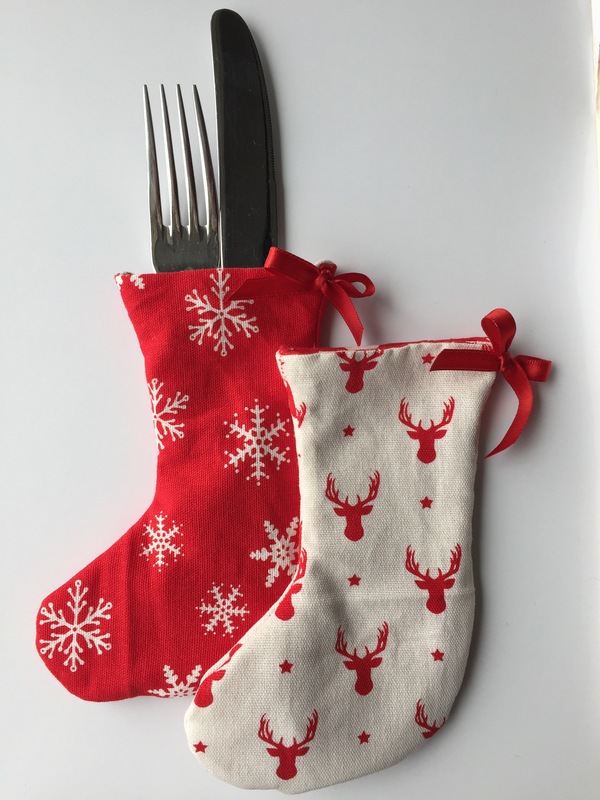 Following on from my 3D Christmas trees are some little mini stocking cutlery holders. These will be perfect for a Christmas table setting. You could also use these to go on bunting, for putting little sweetie gifts in or anything where you require a cute little stocking. Loved using the very cute Stag canvas fabric by The Craft Cotton Company for these.